There are two Florida Lobster Seasons, the 2 day mini lobster season and the 8 month regular lobster season. The mini lobster season is always the last consecutive Wednesday and Thursday in July. It begins at 12:01 am on Wednesday and ends at 12:00 midnight on Thursday. The regular lobster season is always August 6 through March 31. Depending on where you hunt/collect, there are different bag limits. 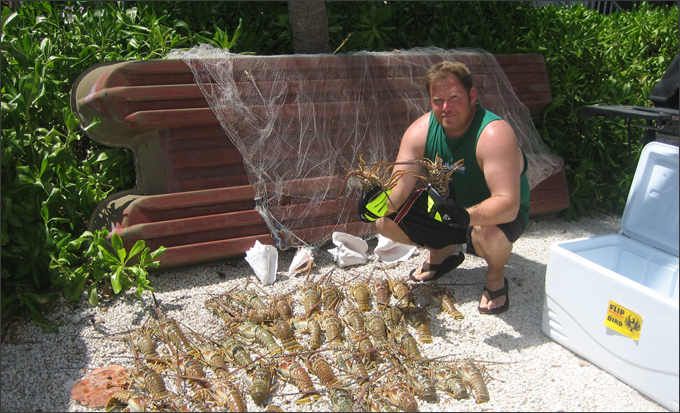 As of July 2009, the limit in the Florida Keys (Monroe County) and in the Biscayne National Park is 6 lobsters per person per day. This applies to both the mini and regular season. Elsewhere in Florida, you can keep up to 12 lobsters per person per day during the mini season, and 6 lobsters per person per day in the regular season. The bag limit should always be verified before keeping any lobsters. A valid Saltwater fishing license and (lobster) crawfish permit is always required when you go lobstering. In addition to bag limits, there is also a size requirement. A lobster must be at least 3 inches in length from the hard part of the forward edge between the rostral horns to the rear edge of the carapace. 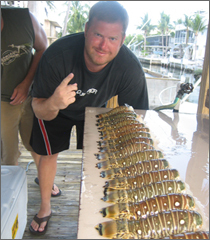 Please see our how to measure a Florida lobster page for pictures and detailed instructions. No lobster should ever be placed in a bag or taken out of the water unless it has first been measured and is of legal size. You should always verify what the current legal size of a lobster is before you go.